Ah, fall. Season of soups. You guys know by now that I love raw soups. Which is a little funny, since I was never a fan of cooked soups. Or rather, I was never a fan of cooked soups with lots of stuff in them: chicken noodle, minestrone, miso, vegetable barley, whatever. I could handle the blended, creamy ones: butternut squash, cream (ew) of leek, cream (ew) of mushroom, carrot—but that makes sense, since those are the soups that raw soups most closely resemble. To make a long and not very cool story short: I like creamy soups. I really like them even better when they’re raw. The end. 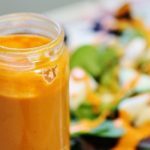 Why are raw soups so great? Well, for one thing, they’re chock full of enzymes, nutrients, and fiber, but their blended texture makes them highly digestible. This means they’re great for anyone who suffers from impaired digestion, or simply for any occasion when you need to give your digestive system a little TLC (illness; pre- or post-workout; when you’re rundown). They’re also quick and easy: raw soups don’t require making a perfect roux, waiting for vegetables to soften, or spending hours watching a pot simmer. And for most of us, soups evoke sweet childhood memories of simplicity and comfort. If the thought of eating soups cold upsets you, don’t be deterred: it’s perfectly OK to heat them gently over a very low flame until they’re room temperature. If you’re not strictly raw and don’t care to be, go ahead and warm them up as much as you’d like! You’ll be seeing a ton of soups—probably more than you’d like to see—as the weather cools down. I’m starting my soup marathon with a new recipe I tried out last week (my friend Cassie is finishing off my leftovers! ): red pepper and hemp soup. I wasn’t sure about this one: hemp is such a distinctive flavor that I worried it might overpower the peppers. But after my success with creamy hemp basil sauce, I figured it couldn’t hurt to try. And it didn’t. Quite the contrary. This soup is sweet, creamy, and a little nutty tasting, but what really makes it shine is the kick from lemon juice and turmeric. It’s quick, nourishing, and—for those of you who are hung up on that whole protein thing—rich in protein, too. Enjoy it! You can add garlic or onion to the soup. If you’re into that. Hope you all had a great weekend. I’ll be back this week with a cooked recipe, a question of the week, and more! Looks like the PERFECT meal, Gena Bean-a! You already know I’m not a fan of soups 😉 But that combination sounds incredible! And yes, I’d be adding LOADS of garlic. BEAUTIFUL. And I have everything to make it in my fridge. Thanks as always for the fantastic inspiration! Yay! for soup recipes! Love it, I’m going to have to try this tonight, but maybe with a little tweaking as I only have one red pepper. 🙂 Looks too good to wait on a grocery store visit, though. I am so happy to hear more soup recipes are coming. 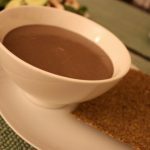 Raw soups are so simple to make, and so tasty. Perfect dinner for me after a long day at work, and my son loves them as a sauce for veggies and noodles, or just for dipping. I adore cold soup, so this actually sounds great to me!!! Great soup! 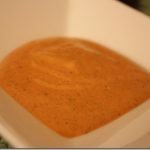 It reminds me of Kristin’s Cheezy Hemp Nacho sauce. Yours has fewer ingredients but red pepper, hemp, water, tumeric, lemon juice are in both your recipes. have a great week Gena! 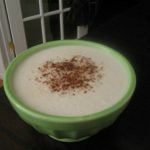 I’m super excited about seeing more raw soups on your blog, Gena. They sound delicious and perfect for fall. blech to the garlic, ill keep that smelly beast on the sidelines, just like you. Keep the soups coming! I’ve tried to do some raw soups on my own (sans recipe that is) and boy have I been mostly a failure. So I’m going to be sticking to my raw guru Gena as I should have been in the first place. I’m sure that this one will be a winner as I love hemp and am definitely a fan of red pepper. By the way, I love the soup serving dish. I have no square bowls, and can’t say that I’ve ever eaten out of one before. Really, I do feel like I’ve been missing out. I’ve been enjoying raw soups lately, too, but I’ve always been a fan of them, especially the chunky stuff. They just seem more satisfying. However, that doesn’t mean I don’t like the creamy stuff, as well. Yours looks yummy. I love cooked soups but I love raw soups too, and you are the queen of raw soups! They always look so good and they taste even better. 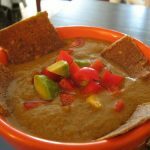 I make your raw tortilla soup at least once a week, it is genius. Thanks for another great recipe for me to try! Oh and just because I feel like I should tell everyone with a pulse, I WON AN ICE CREAM MAKER! There is a lot of coconut hacking in my future. MMMMMM! That soup looks so good for a sista’ with a cold right now. Yucko. What a delicious combo. The salad especially. Yum! This soup looks wonderful! I honestly have not used hemp seeds in cooking before…..I always just seem to sprinkle them on things 😉 I can’t wait to try this! Looks fabulous! And I think I have all the makings in my fridge right now… Yum! The cranberries are cooked so I suppose it does not play out as raw??? will definitely try this one. thanks for sharing! Just made this soup for lunch, yummy!! The curry powder is what really sold it to me. Were I live hep is really expensive and not so easy to get hold of. Do you think it will still be good with other seeds, such as sunflower?